Announcing Android 2.0 support in the SDK! Android 2.0 brings new developer APIs for sync, Bluetooth, and a few other areas. Using the new sync, account manager and contacts APIs, you can write applications to enable users to sync their devices to various contact sources. You can also give users a faster way to communicate with others by embedding Quick Contact within your application. With the new Bluetooth API, you can now easily add peer-to-peer connectivity or gaming to your applications. To get a more complete list of the new capabilities you can add to your applications, please go to the Android 2.0 highlights page. The SDK Manager allows you to add new Android platforms to your SDK. 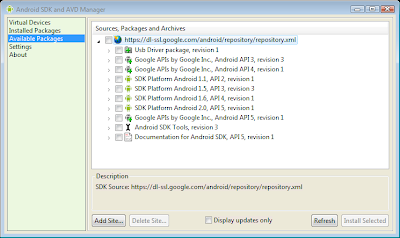 Android SDK Tools, revision 3 is required to develop for Android 2.0. It includes support for code coverage through the Ant build system, as well as Mac OS X 10.6 (Snow Leopard) support for the SDK and related tools. For those of you who develop using Eclipse, we are releasing ADT version 0.9.4 through the usual Eclipse update mechanism. Download the Android 2.0 platform and make sure your existing apps continue to work on new devices running Android 2.0. Make sure that your apps work when using the WVGA (800x480) & FWVGA (854x480) emulator skins. We expect devices with these types of screen, running Android 2.0 to be launched soon. Checkout the video below for more information about Android 2.0. 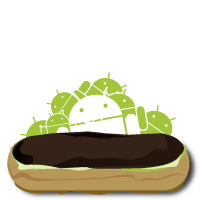 I am excited to announce that the Android SDK now supports Android 2.0 (also known as Eclair). We will now be reviewing the results and preparing for round 2. Please stay tuned for information about round 2, where the community, combined with a panel of judges, will narrow down the top 20 applications in each category to determine the final winners. Until then, users with the ADC 2 judging application currently installed will get a notice saying that round 1 is over. When round 2 opens, the judging application will resume giving out new submissions to score. We look forward to seeing the results of the final round and hope that you choose to help us score these top apps as well! The response to round one of the Android Developer Challenge 2 has been phenomenal! We originally expected that it would take two weeks to get all the necessary data to complete scoring. Over the last 10 days, more than 26,000 Android users reviewed and submitted our target of over 100 scores per application. With this enthusiastic support of the Android community, we are closing the first round of ADC 2 judging today.